Plus sizing, which is a term used for increasing the diameter of the wheel from its initial size is gradually becoming popular among many car owners. The preference of having oversized tires is not just a matter of style but also an opportunity to have a car with a better cornering grip and handling capabilities. Oversized tires are simply the ultimate solution to increasing the car’s performance among many other reasons. When in need of wheels for oversized tires, there needs to be some decisions to be made. Firstly, before plus sizing, one needs to study the car in question i.e. its make and model in order to be able to choose the right wheels. This is because some makes of cars can only support plus sizing to a given level in order to not alter its effectiveness. The rule of thumb that has to be applied at all times is to only increase the width of the tire by not more than 10mm and decrease the height of the sidewall by 5-10% for every inch increased in the diameter of the wheel. This ensures that the car remains proportional and continues to perform as well as it did before, or even better. When plus sizing, it’s equally important to check the wheels and the materials used in their manufacture. Most of the plus-sizing wheels are made of aluminium or an alloy of steel and aluminium. There are also are some made of carbon-fiber. Though the latter tend to be the best to uphold all the weight and size of the new oversized tires, they may be a bit expensive than the aluminium ones. One should further check whether the wheels fit the vehicle perfectly. What ought to be checked are the wheel’s lug-nut pattern to ensure that they are well aligned and that once bolted, they don’t get loose while driving. The right way to purchase wheels for oversized tires is by buying them as a set. This is because when sold in pairs, they are normally very well mounted and balanced. 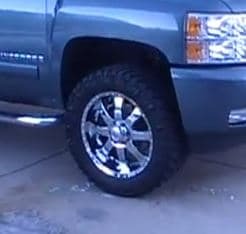 And, to prevent any damage to the wheels or the tires, one should hire an experienced installer to plus-size. The key benefit of plus-sizing is that the car ends up giving more comfort. In addition, oversized tires give an all weather grip hence making driving much easier and hassle free. However, plus sizing could lead the bigger cars to stick rather than slide on the road when making emergency manoeuvres. A driver may similarly experience more strain on suspension parts, brakes and wheel bearings.